A video grab from footage broadcast by the U.K. Parliament's Parliamentary Recording Unit shows Canadian data analytics expert Christopher Wylie at the Houses of Parliament in London on Tuesday. The Canadian whistle-blower who helped launch AggregateIQ has levelled a scathing attack on the B.C.-based technology company, accusing it of participating in dirty-tricks campaigns spanning the globe, from spreading violent anti-Muslim videos in Nigeria to hacking data in St. Kitts and intervening in the 2016 U.S. presidential election and the Brexit vote. 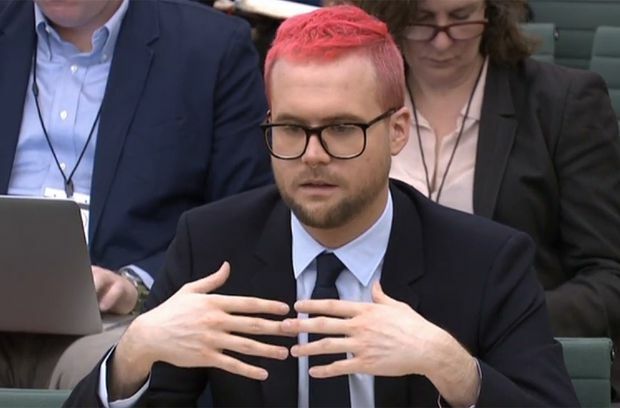 Christopher Wylie, who was instrumental in setting up AggregateIQ Data Services Ltd. (AIQ) as well as political strategists Cambridge Analytica, told a British House of Commons committee on Tuesday that AIQ developed a key software program that he alleges was used to misuse Facebook data during the campaign won by Donald Trump. Mr. Wylie highlighted AIQ’s alleged role in the 2015 presidential election in Nigeria, saying the company distributed violent content on social media to discredit Muhammadu Buhari, who was running against then-president Goodluck Jonathan. The videos included “content where people were being dismembered, where people were having their throats cut and bled to death in a ditch,” Mr. Wylie told the committee. Other videos showed people being burned alive and still more had “incredibly anti-Islamic and threatening messages, portraying Muslims as violent.” Despite the ads, Mr. Buhari won the election. A woman walks past an empty office suite, which had formerly been used by Canadian data firm AggregateIQ, in a building in Victoria, B.C., on Tuesday. Mr. Wylie, 28, helped create Cambridge Analytica in 2013 shortly after joining another British company called SCL Group. Cambridge Analytica devoted much of its work to U.S. political campaigns and it was funded largely by Robert Mercer, a U.S. billionaire with ties to Steve Bannon, who helped run Mr. Trump’s presidential campaign. Mr. Wylie said he recruited two friends from Victoria to join SCL in 2013: Jeff Silvester and Zack Massingham. They all knew each other from their days volunteering with the Liberal Party in B.C. When Mr. Silvester and Mr. Massingham said they couldn’t move to Britain, Mr. Wylie said SCL agreed to set them up as a kind of SCL “franchise” in Victoria. Mr. Silvester and Mr. Massingham called their company AggregateIQ, but Mr. Wylie alleges it was essentially an arm of SCL and, later, Cambridge Analytica. AIQ workers were listed in the SCL staff directory and the Victoria company derived almost all of its revenue from Cambridge Analytica projects, which centred around developing sophisticated programs to target political ads on social media, Mr Wylie said. He alleged AIQ was kept as a separate entity in part as a way to hide any paper trail leading back to Cambridge Analytica or SCL. In Nigeria, Cambridge Analytica had been hired by a wealthy local businessman to help Mr. Goodluck. Mr. Wylie alleged Cambridge Analytica hired Black Cube, an Israeli business-intelligence firm, to hack into computers in order to get medical records and e-mails belonging to Mr. Buhari. AIQ was handed hacked information and violent videos to use in social-media advertising, he added. Mr. Wylie testified that AIQ was also instrumental in developing the Ripon software that Cambridge Analytica used to target Republican voters in the 2016 U.S. election. The software was a critical tool to help Cambridge Analytica sort data from 50 million Facebook users that the company had acquired as part of a project with Aleksandr Kogan, a Cambridge University professor who obtained the social-media information through an online app he’d developed. “It was AggregateIQ that built the software,” Mr. Wylie said. He gave members of Parliament on the committee copies of the Ripon development contract and licensing agreements between AIQ and Cambridge Analytica. AIQ has come under investigation in Britain over its role in the Vote Leave campaign. Roughly 40 per cent of Vote Leave’s £6.8-million ($12.4-million) budget went to AIQ for social-media advertising. The company received an additional £625,000 ($1.14-million) from another campaign group called BeLeave. Mr. Wylie said AIQ’s work for Vote Leave was effective and he noted that the “conversion rates” on its social-media ads were up to 7 per cent in some cases. Those rates refer to the number of times someone not only sees the ad but also performs some kind of action such as donating money or signing up to volunteer. The typical conversion rate is around 2 per cent, he said. After the referendum campaign, Mr. Wylie said he met Mr. Silvester to talk about AIQ’s success. Mr. Silvester and others at AIQ “were very, very pleased with themselves at how that project went,” he said. He added that the committee has yet to decide whether to ask AIQ officials to testify.